TALKING ABOUT VARIOUS DATA MODELLING TRENDS, my experimental twitter footprint from the microblogsphere over the past 30 days of tweeting shows something like this. Overall, the positive vibes (:-), interesting, sure, lol, okay, good, ...) clearly outweighed the strains (in spite of having long and stretched work days). Surely, this would have its contributions towards the real-time positive attitude index which tracks people's moods within the twitter system. 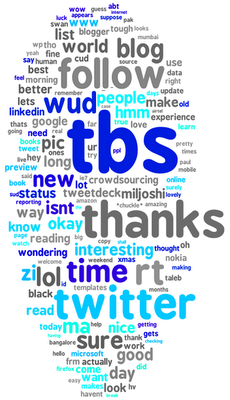 Go here to get your own Wordle from your twitter-feed via TweetStats.com. Nice, simple, usable new look & feel for handheld devices..